The vast archives of two remarkable photographers from West Africa who passed this year will ensure that authentic images of African life will be their legacy to future generations. The images radically depart from the clichés of colonialism. Malick Sidibé, whose pictures of Mali’s youth conveyed the high-spirited feeling of a country that has just gained its independence, passed away at 80 years of age. His black-and-white pictures influenced many of his contemporaries in Africa and beyond. Sidibé died of complications of diabetes, according to Associated Press reports. Known as “the Eye of Bamako”, Sidibé cycled to nightclubs in the evenings, photographing party-goers with his first camera, a Brownie Flash. His documentary-style photography offered a rare glimpse into African youth culture entering a new era. He leaves behind three wives and 17 children and will be buried in his birthplace, Soloba. 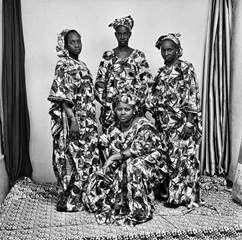 Also this year, the great Senegalese photographer Oumar Ly passed on Feb. 29, at the age of 73. He had produced an archive of more than 5,000 pictures — an anthropological treasure of daily life in Senegal – presenting an unaltered look at the women, men and children who, over 50 years, visited his little studio in Podor, the country’s northernmost city.